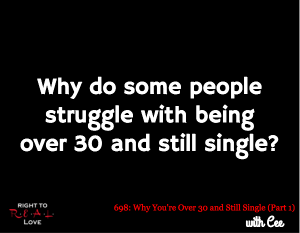 In this episode, Jay is joined by Cee to address the question: Why do some people struggle with being over 30 and still single? Why do some people struggle with being over 30 and still single? The pressure placed on unmarried people by society, family and friends. Why it is important for us to love ourselves. Reasons why most people over 30 are still single. The value in taking our time during the process of courtship and dating. The danger of losing hope. The importance of trusting in God. Know why you’re single and choose not to view being single negatively. Examine why you’re single and why it frustrates you.